With more than 61 different species of mammal inhabiting Yellowstone National Park, the number of small mammals is still extensive. Eliminating larger creatures, such as bears and hoofed animals, leaves raccoons, foxes, rabbits, weasels, rodents, shrews and bats as Yellowstone's assortment of small mammals. The largest group of small mammals is rodents, with 21 different species, including six kinds of voles. Nine types of weasels live in Yellowstone, along with 10 kinds of bats. Weasels are aggressive carnivores with long bodies, short legs and flattened heads. They belong to the genus Mustela, and many people call them polecats. Yellowstone park is home to badgers, fishers, martens, mink, river otters, skunks, long-tailed weasels, short-tailed weasels and wolverines, all belonging to the weasel family. The striped skunk and wolverine are rarely seen in Yellowstone, but the other weasel species are commonly found in the area. Rodents and shrews encompass the largest group of small mammals found in Yellowstone. 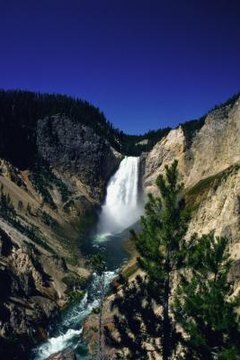 Species living in Yellowstone include beavers, two kinds of chipmunks, yellow-bellied marmots, four types of squirrels, northern pocket gophers, two types of mice, muskrats, six kinds of voles, bushy-tailed woodrats, five types of shrews and porcupines. Rodents and shrews possess constantly growing rootless incisors that require powerful gnawing to keep teeth shortened. Yellowstone National Park is home to snowshoe hares, white-tailed jackrabbits, desert cottontails, mountain cottontails and pika. The snowshoe hare is nocturnal with fur that changes color with the seasons. It runs on top of the snow and lives in pine forests. Cottontail rabbits live in the scrublands, while jackrabbits prefer grasslands. Pika -- short, stout rodent-like animals -- live in the rocky crags of the higher elevations in Yellowstone. Little brown bats are common in Yellowstone, but the park’s other bats tend to be a bit shy of human visitors. Other species of bats living in Yellowstone include big brown bats, fringe-tailed bats, hoary bats, long-eared bats, long-legged bats, silver-haired bats, western small-footed bats, Townsend's big-eared bats and Yuma bats. Both the western small-footed bats and the Yuma bats are rarely seen. Raccoons can be found living in Yellowstone near rivers and cottonwood forests although, according to the National Park Service, these pesky small mammals are rarely seen there. The shy red fox, the smallest canine residing in the park, can been seen frequenting the meadows within Yellowstone. Often, foxes will hunt rodents in the grasslands during the dusk and dawn hours.